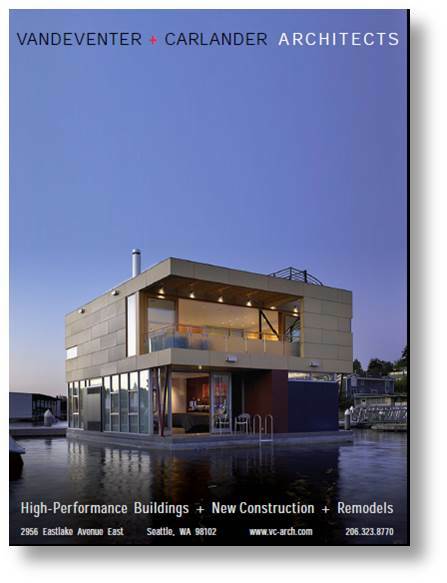 Monday July 25th, 2016 (Seattle) – The Seattle Floating Homes Association is pleased to announce the Floating Home Tour on Sunday September 11, 2016 from 12 to 5 p.m. The Tour will give visitors the unique chance to visit and discover the colorful history of 13 floating homes hidden along the seldom visited banks of Portage Bay. Tickets are limited and go on sale July 25th through Brown Paper Tickets (www.brownpapertickets.com). Ticket price is $40. Capacity is limited so advance purchase is highly recommended. Proceeds from the event will benefit the Seattle Floating Homes Association and its mission to protect, preserve and promote the vitality of Seattle’s historic floating homes community through education, advocacy, environmental stewardship and collaboration. The tour features 13 homes exclusively in Portage Bay, as well as a peek into the University drawbridge house! Admission price includes bus shuttle transportation between the Queen City Yacht Club and Pocock Rowing Center. This is a self-guided WALKING tour. This year, the tour includes many sets of stairs and uneven docks. The tour is not recommended for anyone who has any walking impairments due to the excessive stairways and erratic surface of the docks. Please wear comfortable walking shoes. Participants will be required to remove their shoes or put on paper slippers over their shoes; slippers will be provided. No backpacks, strollers, food or drinks are allowed in the homes. The tour will take place rain or shine, and participants of all ages will be required to have a ticket, with the exception of babies in arms. Food and coffee will be available for purchase. The floating homes we are featuring in Portage Bay this year reflect the wide variety of styles and sizes available on Lake Union. Marvel at the inspired use of storage required in Lake Union’s smallest floating home, which is just 450 square feet and includes doors made of recycled paper. Contrast that with the 1,850 square foot floating home which features three bedrooms, three bathrooms, and three decks, including an expansive roof top deck with water vistas from east to west. Maybe it’s the interior styles that rock your boat? Come see the Shelby Dock house built in the 1920s which retains its entire original interior paneling and is accented with the owners’ Swedish heritage including birch bark pictures, a troll-doll collection, and serpent-shaped wood carvings. Compare this to the magnificent architecture and interior design of one of the Bay’s finest homes, capped with copper roofing. Visitors on the Seattle FHA tour will also experience a wide variety of color palettes – from the natural tones of oak and walnut floors, bamboo cabinets and cedar siding, to the dazzling home filled with bold colors – fuchsia, lime green, butternut, and candy apple red to name a few! Then there’s the residents themselves, ranging from those who have lived aboard their ‘floating on water residences’ since the early seventies when they were students at the University, to those who recently arrived from the Eastside suburbs, having left as soon as they became empty nesters. Top that off with a visit to the University Drawbridge (please don’t touch the levers!) and you will have gained unique insight into the lifestyle of those lucky enough to enjoy life afloat in peaceful Portage Bay. The Seattle Floating Home community represents a unique way of life, balancing urban living with nature. The community began as low cost housing for loggers, fisherman and boat builders working on the lake and became a colorful gathering of bootleggers and dime-a-dance halls during the Prohibition Era. As the Great Depression arrived, the community attracted the independent and resourceful homeless looking for a place to survive. Eventually it evolved to a community of artists, students and a more bohemian culture with over 3000 rag-tag floating shacks in the 1960s. The community now holds only 500 floating homes and attracts a diverse group of water-lovers who cherish a life in natural habitat and protect it as stewards of the lake. Today, the docks also provide a sanctuary for wildlife such as beaver, otters, eagles and blue herons that are no longer found in other metropolitan areas of this size. It is a special habitat where people and wildlife co-exist peacefully in the middle of a major city, a badge of honor that Seattle proudly wears. Visit www.seattlefloatinghomes.org/tour, contact FHA Office Manager Jann McFarland at 206-323-3489, or email floatinghomesseattle@gmail.com. You can also find us on Facebook at www.facebook.com/FloatingHomesAssociation/ If you have specific questions regarding the tour, email the tour director, Sue Jostrom, at suejostrom@mac.com.